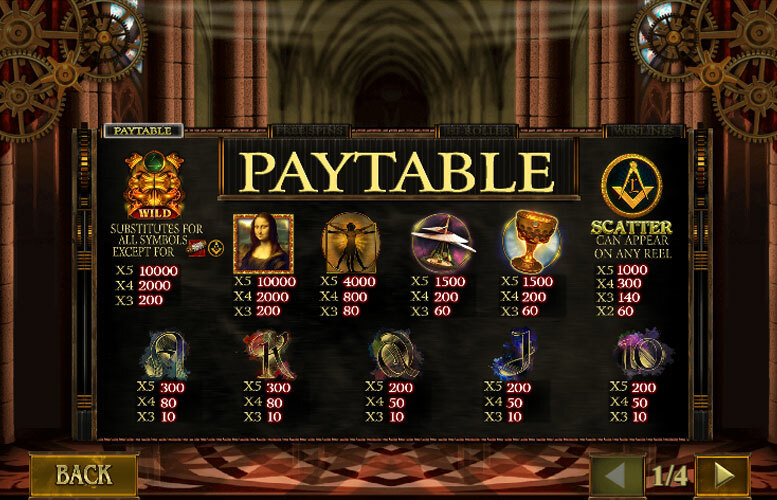 Playtech have created a cracker with Da Vinci’s Vault. It has great character from the off, with its fantastic art style and eerie soundtrack giving it a mysterious feel. During the main game, some massive prizes can be won too. Unfortunately, the game does feel old rather fast as it lacks variety in its features. The hi-roller mode is a nice addition, however. Brilliantly atmospheric. The art style and symbol design complement each other to give a game with a great look and feel. Monstrous main game prizes. There are multiple ways to win four digit prizes on Da Vinci’s Vault. Innovative game features. They’re not free but they do make the action more exciting. Unless you’re playing the hi-roller game constantly, it might get dull quickly. The maximum bet per spin is somewhat low. It’s possible to up it using the hi-roller mode but it’s unclear how your return-to-player rating will be affected by doing so. “Wild” Crest = 10,000x the line bet. Mona Lisa = 10,000x the line bet. Vitruvian Man = 4,000x the line bet. Flying machine, or Goblet = 1,500x the line bet. “Scatter” Symbol = 1,000x the line bet. 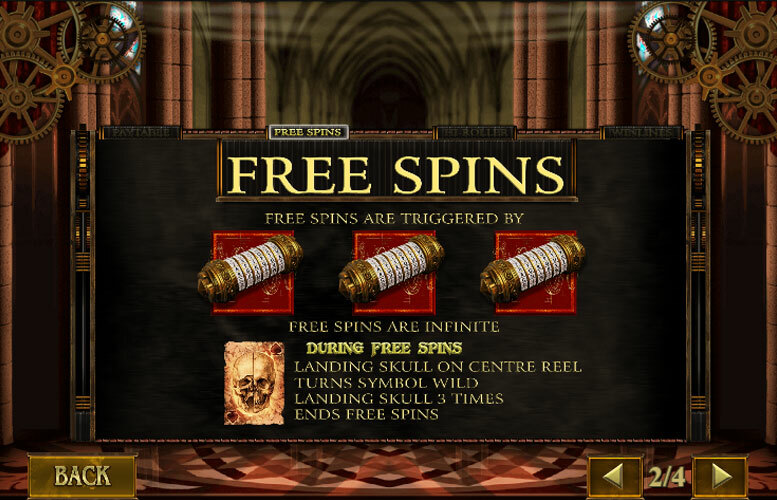 Landing three scrolls anywhere on the reels will trigger the free spins mode. These are infinite. During the game, there is an extra symbol added to the reels. The skull landing on the centre reel will turn the position it landed in “wild”. However, landing three skulls will end the bonus stage. At any point during the game, players can enter the hi-roller game. Here, they must buy five hi-roller spins at a cost of 10x the total bet. During this game mode, player must collect different coloured crests to unlock the vault wheel. The gold wheel awards players a cash prize, free spins, or access to the inner gold wheel. This wheel awards even larger cash prizes or more free spins. The silver wheel awards cash prizes or free spins. Finally, the bronze wheel awards cash prizes. Ace, or King = 300x the line bet. Queen, Jack, or 10 = 200x the line bet. 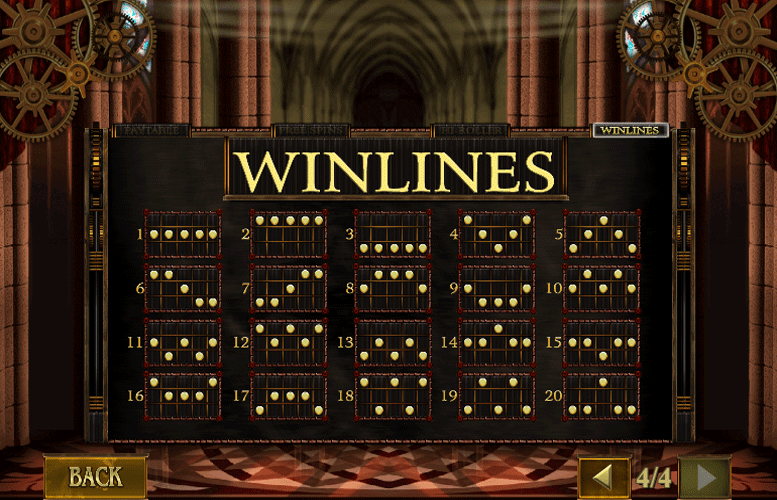 The number of win lines is fixed on Da Vinci’s Vault. Players are therefore only able to adjust the total bet. The minimum is 20p and the maximum is a rather underwhelming £100. Unfortunately, this low betting limit will discourage some of the highest rollers from playing the title. However, at this maximum, each hi-roller round is a much larger £1,000 per five spins. This makes it somewhat better for those wishing to seriously splash their cash. As mentioned, however, it’s unclear how using the hi-roller mode will affect the return-to-player figure. 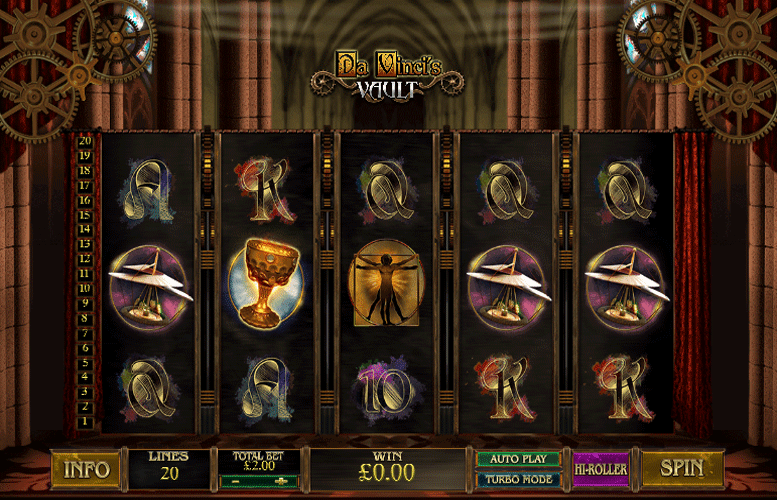 If you love slot machines with top-heavy prizes and bags of character, Da Vinci’s Vault might be just the game for you. There are multiple symbols that will award huge prizes for matching five-of-a-kind and the vault itself can be lucrative too. However, when it comes down to it, the gameplay is somewhat lacking. The free spins mode has a novel twist but it’s highly unlikely you’ll actually have a huge run of free spins. The hi-roller mode does add an additional layer of drama to the game but this too is short-lived. This game has a rating of 3 / 5 with 449 total reviews by the users.